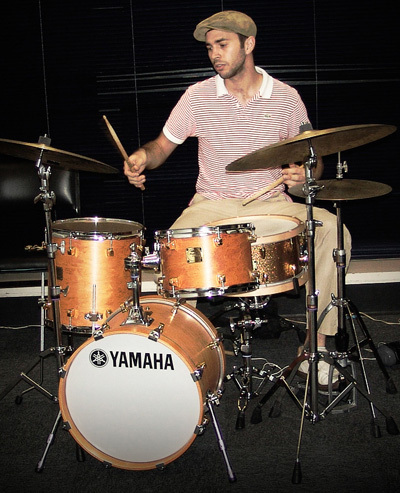 Sacha Kloostra is one of Australia's premier all-rounder drum kit artists. Whether burning with a jazz quartet, grooving with a funk or rock band, or lighting up the dance floor with a Cuban salsa ensemble, Sacha has proven his mettle with the best of them, and continues to break new ground with his delicate, yet explosive drumming. Sacha currently holds the drum chair in Afro-Cuban salsa ensemble ‘Chukale’, and Latin-jazz combo ‘The Louise Denson Group’, and over the years has performed with a vast array of esteemed artists and groups from Australia and abroad including Miguel, Enthusiastic Musicians Orchestra, Hot Mambo, The View From Madeleine's Couch, Watussi, Los Mambises, West End Composers Collective, Osmar Salazar Hernandez, Marialy Pacheco, Felix Baloy (Cuba), Sixto "El Indio" Llorente (Cuba), Polo Tamayo (Cuba), Antonio "Leal" Rodriguez (Cuba), Wilson Saoko (Columbia), David Allen, Mark Sholtez, John Hoffman, James Sherlock, Steve Newcomb, Timothy Franklin, Jeff Usher, Rafael Karlen, Dave Spicer, Damian Sim, Shannon Marshall, Stacey Broughton, Ingrid James & more.